It's only 23nm from Heligoland to the safewater mark at the entrance of the River Eider but then it's almost as far again to a harbour. For vessels coming out of the Eider the round red and white buoy indicates the end of channel restrictions and the start of open water, but for us coming in it means goodbye to the German Bight and the North Sea and hello (again) to sandbanks and shallows, buoys and then withies. You may have read enough about "Riddle of the Sands" already in this blog but just a quick note for the benefit of fans: the route we are taking to the Baltic now is the same route Davies took, in the "back story", after his narrow escape from foundering on the treacherous sands, lured astray by the dastardly Dollman. For the record it also features in the Cruising Association Almanac as Route 2a. Before the construction of the Kiel Canal this was the way through, the shortcut linking North Sea to Baltic Sea. Opened in 1784 it made a huge saving on the distance (and weather) involved in sailing round the top of Denmark. Further up it's canalised but for now it's a big wide estuary. Yet again our Navionics electronic charts are wrong. Howard took the photo below of what they were showing as we followed the buoyed channel and you can see below that we certainly couldn't rely on the charts we have on our plotter if we had poor visibility here. 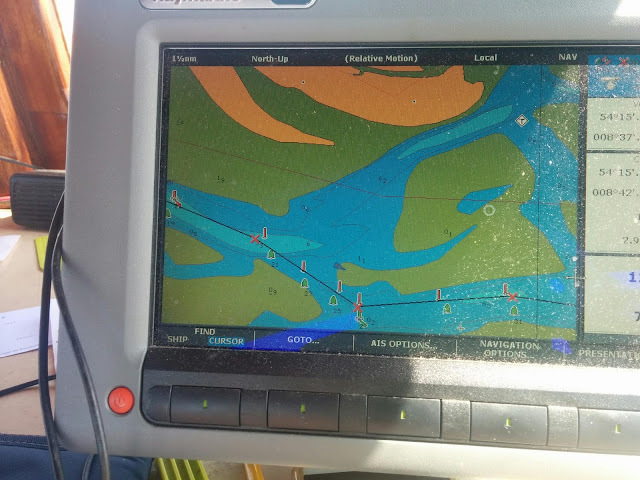 Instead of following the line of waypoints we had prepared we followed the actual buoyage. To the eye, there is water everywhere. We need binoculars to watch distant horses and riders galloping along the broad sandy shore north of our channel and the fat lazy seals basking on the sand banks to the south. (Not a judgement, just an observation you understand. They might justifiably say the same about us). Eventually it does narrow down and 12 miles after the safewater mark we lock in next to the storm sea defences at Eider-Sperrwerk. 5 more miles between shallow banks and we turn in to the small harbour at Tönning. When this was a commercial shipping route Tönning was an important last stop on the way west. There were 3 so-called Packhäuser, or warehouses, built on the route. Huge ones at each end and one smaller one in the middle of the route at Rendsburg. It is in front of the imposing Tönninger Packhaus that we tie up and prepare to sink into the mud. Although we locked through at Eider-Sperrwerk, that is a storm lock and the river is still tidal so boats enter and leave this harbour only around high water and sit in the mud when the level drops. We have sailed for years on the east coast rivers in England so we are not afraid of a drying harbour: we know Bonify will float happily in the mud. We just need to keep a jug of water handy in the heads tonight for flushing, and remember not to try and pump in to the loo or we'll fill our holding tank with Schleswig-Holstein mud.